This month, we profile four classic sports cars of the 1970s, and point out some of the pitfalls potential buyers may face. Sports car fans were spoiled for choice in the 1970s. The fastest and most exotic machines came from Italy in the form of the V12-powered Ferraris and Lamborghinis and V8 Maseratis, but all the while the Italians produced a second layer of smaller, less expensive though still evocative sports cars with sub three-litre V6 and V8 engines. 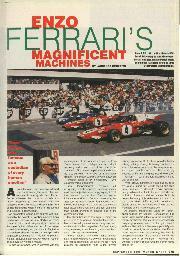 The Ferrari Dino was the standard bearer, challenged by the Maserati Merak and the Lamborghini Urraco. 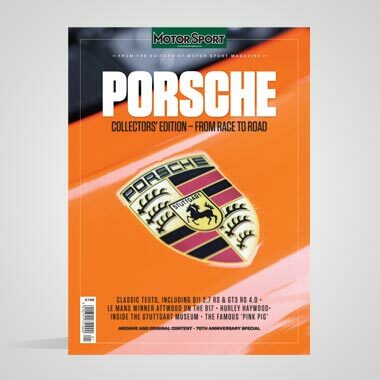 In Germany, Porsche's 911 model went into its second decade with the Turbo model, which became a true 'supercar', and in Britain Lotus reached a higher plane with the Esprit which MOTOR SPORT featured in July. The world's first energy crisis, which began to bite at the end of 1973, threatened to extinguish the European based sports car industry, and but for the three-litre models might well have done so. Maserati was almost put out of business when Citroen decided that the Trident was too sharp a toy to own in turbulent times, Lamborghini went into decline, and only Ferrari was protected by the benign Fiat Group. The Fiat Dino line was effectively started in October 1965 when the Dino 206 S Speciale appeared on the Pininfarina stand at the Paris Salon. The engine (a dummy, as it turned out) was a new design by Vittorio fano, with input from Dino Ferrari before the scion's untimely death. A working prototype was exhibited at the Turin Show the following year, and the first 100 cars (two-litre, V6 gave the designation 206) were sold in Europe between 1967 and 1969. The engine was manufactured by Fiat and Scaglietti made the bodies... and there was no Ferrari badge to be seen. Where the prototype's engine was mounted north-south between the bulkhead and the rear wheels, the production cars had transverse installations. America was not greatly interested in this two-litre buzz-box, and Ferrari responded with the much more practical Dino 246GT. As the designation implies the capacity was raised to 2.4 litres, power rising from 180 to 195 bhp. The torque rating was considerably improved, as was the emphasis on driveability. Still the Dino lacked a Ferrari badge, but it was sold throughout the world by Ferrari dealers. Midway through the run the GTS version was introduced. 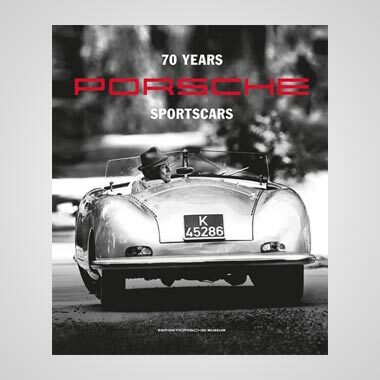 S was for Spyder, but it was a Targa-top model (to use Porsche's nomenclature). 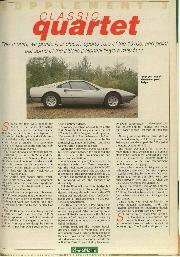 The Dino came of age in 1973 when Enzo Ferrari put his name and badge on the 308 model designated GT4, indicating fourseater. Unlike its predecessors, the 308 was actually a 2 + 2 designed and produced by Bertone with rather angular styling so typical of the house. Ferrari produced the Franco Rocchi designed engine in Maranello, and this presumably moved Enzo to put his name to the car. It was an entirely new 2926 cc V8 with dual overhead camshafts (belt driven, a 'first' for Ferrari), aspirated by four Weber 40 DCNF carburettors. It developed 255 bhp, or 240 bhp for America, and would quite easily exceed 150 mph on limit-free roads. Although Alfredino (Dino) Ferrari died of muscular dystrophy in 1956, long before the 308 engine was developed, the 308 carried the name Dino until 1977. The Ferrari was not a four-seater any more than others which made a nominal claim to be (Porsche 911 and Jaguar E-type 2 + 2, for instance) but children could be carried safely, or the rear compartment could house extra luggage. It was a less uncompromising sports car with a wider audience but (as often happens) it was less well liked by the true enthusiasts. Almost 3700 Ferrari 308 GT4s were produced between 1973 and 1979, when the 2 +2 was replaced by the Mondial 8. Styling reverted to Pininfarinia, and the Mondial 8 had a larger capacity engine, at 3.2 litres. The wheelbase was increased by four inches to turn the car into a genuine four-seater. Dino's name was never applied to the Ferrari 308GTB (Berlinetta) and GTS (Spyder), designed by Pininfarina though produced by Scaglietti from 1975-1981. Spurred on by rivalry from Bertone, the Pininfarina studio turned out one of its finest, most classic designs, one that looks as fresh today as it did 20 years ago. The fluted scallops on the sides, just below the waistline, became a Pinfarina styling signature later seen on the GTO and the F40. Making no pretence at producing a 2 + 2, Pininfarina styled an uncompromised two-seater with eight inches chopped from the wheelbase. The power of the three-litre V8 engine was increased to 240 bhp, and it was dry sumped. As before, it was mounted transversely behind the cabin. Early models had bodies largely made of glassfibre materials, and although they were beautifully made Ferrari's customers found it difficult to accept this material, and within two years the 308 GTB was made entirely of metal. The GTS, introduced at the Frankfurt Show in 1977, was a metal bodied car with the exception of the Targa type roof panel which stowed away behind the seats. The 308's performance was pretty good, though not of course on a par with that of the V12 models. Typically a 308 would reach 60 mph from standstill in around six seconds, and 100 mph within 15s, depending on how well the owner had mastered the click-clack five-speed gearbox. Controls generally felt stiff at low speed, especially when the car was cold, but the 308 felt lighter and altogether more driver-friendly as the speeds increased. Side and rear vision was poor, and luggage space strictly limited. Bosch Electronic fuel injection was introduced for the 1981 model year (power dropped alarmingly to 214 bhp), and the V8 underwent a major change for the 1984 model year with a 'quattrovalvole' four-valve cylinder head design which raised the power considerably to 255 bhp (230 bhp with US emission controls). 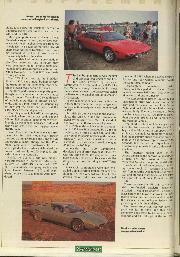 Finally, the 308 GTB and GTS models were superseded in September 1985 by the 3.2-litre 328 GTB/GTS versions with 270 bhp. Pininfarina's exemplary styling was little changed between 1975 and 1989, when the new 348 tb/ts models were introduced. The Lamborghini Urraco was the first and principal challenger to the Ferrari Dino, unveiled by Ferruccio Lamborghini at the Turin Show in 1970. Like the Miura — surely Lamborghini's most memorable product — the Urraco was styled by Bertone, the smaller car as a genuine 2 + 2 seater. In this respect it should have beaten the Dino by three years, but the prototype was not production ready and sales commenced in 1972. Surprisingly the two rivals in the marketplace, the Dino GT4 and the Urraco were styled by the same man, Marcello Gandini, who was then in Bertone's employment. The P250 model which went into production in 1972 was first powered by a 2463 cc single-cam V8, rated at 220 bhp, and later (answering criticisms of poor performance, especially with new emission controls installed) by a twin-cam three-litre engine (P300) worth 265 bhp. Alongside the P300 Lamborghini developed the shorter, two-seat Silhouette with the same three-litre engine, but poor build quality held it back. This was a similar design by Bertone, featuring a lift-off Targa roof. Automobili Lamborghini went into controlled administration (Italian for receivership) in 1973, at a very awkward time for the world's major industries, and remained there until 1980 when the Swiss brothers Patrick and Jean-Claude Mimram bought the Sant'Agata company. Lamborghini remained prolific throughout this period, producing 10 new models between 1973 and 1987, when the Mimrams sold out to Chrysler. The Lamborghini Urraco unusually had MacPherson strut type suspension at the front and rear similar to that of the Datsun 24pZ, and unlike the Dino it had a unitary, all-steel body. Even so, by virtue of being smaller it was also 80-100 pounds lighter than the Dino 308 GT4 and its other rival, the Maserati Merak. The short stroke aluminium engine was mounted transversely, just like the V12 in big brother Miura, and a top speed of 150 mph was claimed. 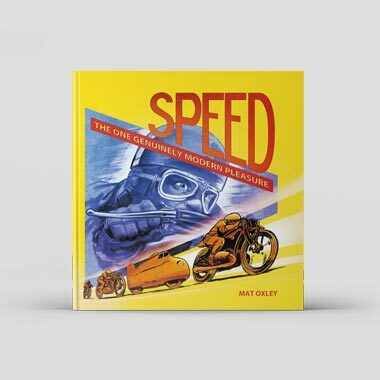 Contemporary reports had the maximum speed at a little over 140 mph, with a sprint to 60 mph in around eight seconds, but the lack of torque from the 2.5-litre engine made it quite a demanding machine. The American market 'died' on the Urraco almost as the car was launched with a mere 175 bhp. 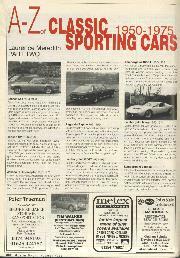 Road & Track, the respected American magazine, said that the Urraco's lack of performance was "mystifying" since it took 10.1 seconds to reach 60 mph from rest (the Dino took 8.0, the Merak 9.2) and stopped in its tracks at 124 mph, well short of the Merak (133) and the Dino (138). These cars were in US trim, of course, with new-fangled catalytic converters installed. It would be another 10 years at least before the Europeans would be subject to similar emission laws, and of course the science of controlling emissions progressed greatly in the mid-80s. The three-litre version was very lively a good car for its time, and this would genuinely accelerate to 60 mph in seven seconds and hit 150 mph at the top end. Even so, sales never took off and the more powerful version wasn't even considered for the American market. Total production of the Urraco throughout the 1970s failed to reach 800, according to Mike Lawrence's authorititive A to Z of Sports Cars' (Bay View Books), far short of Ferruccio Lamborghini's ambition to produce 2000 and give Enzo Ferrari a run for his money. The Urraco and Silhouette were replaced by the JaIpa in 1981, with similar underpinnings. The V8 engine was taken out to 3.5 litres with a tiny increase in power, to 270 bhp, but with a generous torque curve. 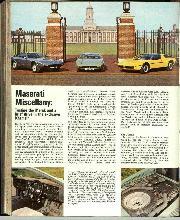 In Modena, Maserati was in slightly better shape under Citroen's ownership, although this was terminated in 1974. It was a very strange marriage between the sporting Maserati concern, besotted with high-performance cars, and the French company which remained out in the wings with the avant garde gas-suspended family saloons. And out of this marriage came the quirky Citroen SM, a Maserati-powered luxury saloon which British sports fans will remember being driven with great gusto by Howden Ganley on the BRSCC's Tour of Britain. The V6 engine which went first into the Citroen and then into the new Maserati Merak in 1972 was designed by Guilio Alfieri, a legendary engineer who'd studied under Gioacchino Colombo in the 1950s. 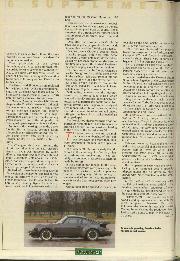 Alfieri was asked to provide an engine for Citroen within six months, and produced a test-bed prototype in three weeks! He had, of course, been working away at a V6 version of the Indy V8, and had only to reduce the capacity to 2670 cc to suit the French tax bracket. 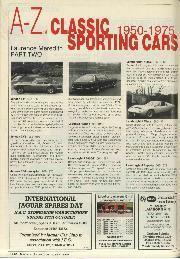 The Citroen SM had 170 bhp, a very healthy figure for a luxury saloon, while the full three-litre version that followed for the Maserati Merak had 190 bhp. 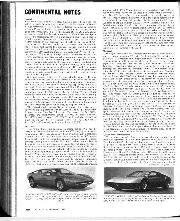 This was not such a marvellous proposition, since the Merak was based on the big, heavy, mid-engined Bora V8 coupe. It had, moreover, the Citroen SM instrument panel and steering wheel which gave it an odd interior. Only after the 'divorce' with Citroen in 1974 did it get a proper dashboard, with circular dials, and the 220 bhp SS engine. Out, too, went Citroen's peculiar brake hydraulic system with near zero pedal movement... what unfamiliar driver did not plaster his passenger to the windscreen the first time he applied the brakes? Heel-and-toe gear-changing was all but impossible. The Bora was styled by Giorgio Giugiaro's new Rai Design studio, and the same stylist did the air-brush job that turned it into the Merak. Notably it had the 'flying buttress' rear deck, awfully similar to that of the Pininfarina-styled Dino and later imitated by Lotus and Toyota, to name but two. With unitary construction the Maserati Merak had a strong, taut chassis which allowed 'a boulevard ride' according to one tester. It was particularly comfortable, too, for tall drivers since Giugiaro had designed seat runners which bowed upwards, suiting short drivers near the wheel and tall drivers sitting further back. A man well ahead of his time, perhaps? The Merak's 90-degree V6 engine was not particularly smooth but it had a tremendous sporting heritage, and was just as pleasing to the driver as the Ferrari's new V8. The Merak was a genuine 150 mph car, when membership of that club was exclusive, and more than 1800 were produced in Modena in the space of 11 years. The Porsche 911 Turbo is clearly the odd car out in this company. It's German, it has an overhung rear engine, and it was certainly not produced in response to anything made by Ferrari. It was a competitor, though, for the same type of customer with plenty of money in his pocket. This customer would appreciate Teutonic build quality, faithful service in summer and winter, and searing performance from the 260 horsepower, three-litre engine. With turbocharging applied to the ubiquitous flat-six the new Porsche, in production in 1975, was a veritable supercar. The Turbo was introduced for a purpose, to gain homologation for the forthcoming FIA Group 4 (GT) and Group 5 ('silhouette') championships. These were supposed to begin in 1975 but were put back a year. By 1976 the flat-six engine was installed in a new open sports-racing car, the 936, and Porsche proceeded to win all three championships in a single season. Porsche needed to make 500 examples for Group 4 homologation, and in Zuffenhausen Dr Ernst Fuhrmann's colleagues were a little concerned that he proposed to offer his customers a luxury car with air conditioning, electric windows, full carpeting and so on. It was an inspired decision, though. After testing the car on the race tracks in 1974 (when a Carrera Turbo finished second at Le Mans) the new 911 Turbo was launched at the Paris Show in October '75, going into production the next Spring. Its performance was sensational. Here was a 2 + 2 luxury coupe capable of accelerating to 60 mph in six seconds, to 100 mph within 13s, and with a maximum speed of 155 mph. The early cars' handling was unpredictable on round-shouldered Pirelli Cinturatos, but improved a lot when the purpose-built P7 became a standard fitting in 1976. This was the car that became the 935, one of the most successful of all Porsche's competition cars in terms of World Championship and IMSA Camel GT successes. And until the McLaren F1 GTR came along, it was also the last production-based model to win at Le Mans. This happened in 1979 when the Kremer Racing team triumphed with a specially adapted model, the K3, driven by Klaus Ludwig with Americans Don and Bill Whittington.